Years before last week's crash of Germanwings Flight 9525 by apparent co-pilot suicide, European Union officials worried that Germany's oversight of airlines was lax and last November formally told Berlin to remedy the long-standing problems. EU officials said Germany's air-safety regulator suffered from chronic staffing shortfalls that could undermine its ability to run checks of carriers and crew, including medical checks, according to two people familiar with the issue. Last week Andreas Lubitz, Flight 9525's 27-year-old co-pilot whose history of depression was flagged in his medical file, crashed the Airbus A320 jet into the French Alps killing himself and 149 others on board, French prosecutors allege. Whether the deficiencies identified in Germany's air-safety supervision were factors in the crash remains unclear. The French air accident office, the BEA, leading the Flight 9525 crash probe said this week it would look at potential systemic weaknesses, including any on psychological screening of crew. 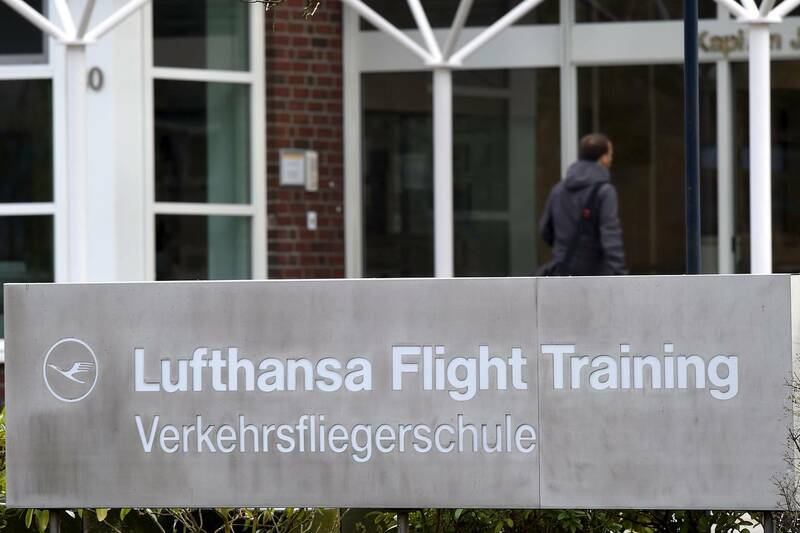 Mr. Lubitz attended the Lufthansa Flight Training school in Bremen. German Transport Minister Alexander Dobrindt said Thursday he would establish a task force to examine similar issues raised by the Germanwings crash. The task force isn't linked to the EU findings, though could end up touching on some of the same issues. Germany has sent responses to the EU's confidential rebuke in November of its federal aviation office, the Luftfahrtbundesamt, or LBA. Commission officials are now reviewing Germany's "corrective action plan to address the findings," a commission spokesman said. Such citations aren't unusual. The EU spokesman said every country in the 28-nation bloc has been cited for some aviation violations, without naming specific areas of concern. But the EU's yearslong focus on aviation practices in Germany, one of Europe's richest economies, is exceptional. According to one of the people familiar with the EU findings, they relate to deficiencies in the LBA's staffing levels and resources, access it provides to medical records and data, and its oversight of approved medical centers and examiners. More than 10 of the findings were related to medical issues, this person said. The LBA declined to comment on the commission's findings. The German transport ministry defended the LBA, which it oversees. "There is no cause for criticism of the LBA," spokeswoman Vera Moosmayer said. The LBA generally remains in the background of pilot screening and only gets directly involved if a pilot has been grounded and seeks reinstatement. Even so, the agency may have had information on Mr. Lubitz's condition, a German medical examiner said, because he took time off from his training in 2009 for psychological issues. Mr. Lubitz informed Lufthansa's flight school that he had taken the break because of an "episode of severe depression," the airline said Tuesday. EU criticism of Germany's shortfall in air oversight dates back at least four years. In 2011, officials from the EU's European Aviation Safety Agency warned that Germany, Italy, Greece and some other countries weren't complying with EASA-mandated oversight requirements as mandated by the commission through EASA. In a highly unusual move, the commission in 2011 placed Germany on its quarterly list of aviation safety alerts, known as the airline blacklist. Its citation warned that the LBA suffered from "an insufficient numbers of qualified personnel" that could undermine the LBA's ability "to ensure continuing oversight." Germany pledged to review personnel resources and staff levels. It was removed from the blacklist in late 2011. The LBA, Germany's equivalent of the U.S. Federal Aviation Administration, subsequently added some staff. But EU inspections continued to find shortfalls, many of which remained unresolved for an extended period, according to one person familiar with the findings. EASA has said it communicates its findings to national civil aviation authorities and invites them to produce a corrective action plan. Airlines aren't involved in the process or implicated in problems. Mr. Lubitz joined Germanwings, a budget unit of Deutsche Lufthansa AG, in September 2013. Before he was hired, he would have undergone psychological screening in a process also involving officials from the government-owned German Aerospace Center. The screening exceeds German legal requirements but is standard for Lufthansa, according to the airline and the transport ministry. Mr. Lubitz's license, which noted he had a special medical condition, required the physician performing his annual flight-fitness screening to inquire about the illness with the pilot himself or with the LBA-approved medical center holding his medical file. The LBA doesn't store or have routine access to pilot medical files unless a pilot, having been grounded, appeals for a return to flying status. That differs from procedures in the U.S., where the FAA holds electronic records at a central facility. 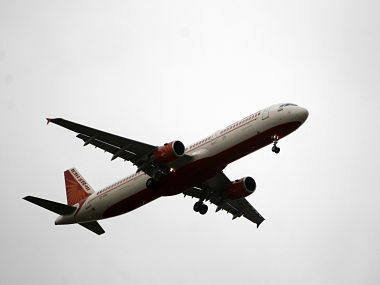 An Air India pilot and co-pilot engaged in a fierce quarrel in the cockpit just before taking off on a flight Sunday from the western Indian city of Jaipur to the country's capital Delhi, reports the Times of India, citing unnamed airline sources. The newspaper's sources say the quarrel erupted over pre-flight procedures and allege that the two men came to actual blows. The airline denies that there was any physical violence. "There was an argument between the two and nothing more," an Air India spokesman told the Times. "They have settled the issue." Although standard procedure dictates that the senior pilot of flight AI 611 should have informed the airline about the incident immediately, he reportedly did not do so because it would have led to the flight's cancellation, the Times says. Instead, he filed a log entry with the airline after landing in Delhi. The Times subsequently reported that both pilots had been suspended over the incident. "Both the pilots have been derostered," airline spokesman G P Rao told the paper. "An inquiry has been ordered into this." The mental health of airline pilots has been under intense scrutiny after the suicidal Germanwings pilot Andreas Lubitz crashed an airplane into the French Alps on Mar. 24, killing all 150 people on board. A passenger jet headed to Chicago got stuck in some mud at a Missouri airport Saturday as it readied to depart, cancelling the flight. American Eagle Flight 3624 went off the tarmac at Columbia Regional Airport, about 120 miles west of St. Louis, as it prepared to take off for its scheduled 4:13 p.m. flight to O'Hare International Airport, NBC station KOMU reported. American Eagle is a regional carrier for American Airlines. American Airlines said in a statement that the 31 passengers and four crew members aboard the Bombardier CRJ 700 were taken off the plane, and the passengers would be put on other flights. NEW DELHI: An Indian Air Force fighter plane has crashed in Chitrakoot in Uttar Pradesh, according to reports. The two pilots onboard the jet are missing. According to Times Now, eyewitnesses saw the two pilots ejecting out before the plane crashed. AMMAN, Jordan - (AP) -- Jordan's military says a training propeller airplane has crashed during a routine flight, killing two pilots onboard. Army spokesman Col. Mamdouh Al-Amiri said the Firefly training plane crashed Monday in a dedicated area for pilot training. Al-Amiri identified the dead as Jordanian Lt. Col. Ibrahim Hasouneh and Iraqi trainee pilot Laith Nasser. He did not offer a cause for the crash. Jordan's military suffered a similar incident in 2013 when another Firefly crashed, killing the two pilots on board. Jordan is currently part of a U.S.-led coalition launching airstrikes against the extremist Islamic State group, which controls a third of Iraq and neighboring Syria. Crashed during a training flight. Both occupants died in the crash. (Reuters) - Aviation regulators are expected to issue new advice to pilots after investigations into the crash of an Air Algerie jet in Mali last July found it went out of control after being hit by ice as an anti-icing system remained switched off. France's BEA crash investigation agency, which is helping Mali to investigate the crash that killed 116 people, said the MD-83 jet appeared to have run into trouble after vital probes that measure pressure on the engine inlets blocked up with ice. Properly working probes are needed to help the McDonnell-Douglas aircraft measure the thrust of its engines. With the probes iced up as the Algiers-bound jet skirted a storm, the plane's autopilot thought the power was too high and slowed the engines below the level needed to maintain cruise height, starting a chain of events that sent it out of control, BEA said on its website. The statement explained some of the causes of the crash and said it had notified U.S. and European regulators who would issue the new guidance. Investigators have been hindered by damage to "black box" cockpit audio recordings, which were unusable, but have spent months reconstructing engine settings from the data recorder of the MD-83 jet which was operated by Spain's Swiftair. Data analyzed suggested the crew had not activated a de-icing system designed to protect the engine inlet probes. The icing over of the pressure sensors is the first possible cause of the crash to be put forward by the investigators. As it fell towards the ground, the jet rolled suddenly to the left and pointed almost straight down, the BEA said. The crash is one of several accidents in which an aircraft is thought to have lost control at high altitude, putting the spotlight partly on training to help pilots identify and then deal with an aerodynamic stall, or loss of lift. The BEA said black box data did not provide any indication the crew had used stall recovery maneuvers, but said the investigation was continuing, with a final report expected in December. It said a similar situation had started to unfold on a similar plane operated by Swiftair less than two months before the Mali crash, but without serious consequences. In June 2002, a McDonnell Douglas MD-82 jet operated by U.S. carrier Spirit Airlines suffered a loss of thrust on both engines. The BEA said it had shared information on all these incidents with the regulators who would soon issue the guidance to help pilots identify similar problems. McDonnell-Douglas was bought by Boeing in 1997. Pilots who signed up for five additional years in the Air Force and an Aviator Retention Pay bonus of $125,000 last year will have the option of going for the full nine years and $225,000. The Air Force said that allowing all pilots - not only fighter pilots - to extend their additional commitments to nine years is one of the most significant changes from last year's Aviator Retention Pay program. In 2013 and 2014, only fighter pilots were able to sign up for as many as nine more years, and get a maximum bonus of $225,000. Other pilots were restricted to five years, with a $25,000 bonus for each year. Pilots and combat systems officers, or CSOs, have until Sept. 30 to apply for this year's retention pay program, the Air Force said in an April 1 release. Depending on the aviator category and length of their service extension, officers can receive between $10,000 and $25,000 per year. Some categories of officers will be able to receive half of the bonus in an up-front lump sum payment. "The Air Force continues to expand previous ARP programs to decisively and deliberately shape and retain the rated force," director of military force management policy Brig. Gen. Brian Kelly said in the release. The Air Force also said pilots who are signing up for retention pay for the first time, as well as CSOs supporting drones, will receive a rate that is lower than the maximum $25,000 bonus. The Air Force did not say by press time how big those bonuses will be. "Although previous CSO retention efforts have been very effective, there are shortages in the overall number of fighter (12F [Air Force Specialty Code) and rescue (12H) CSOs, and the [12U remotely piloted aircraft] enterprise continues to grow to meet steady-state requirements," Air Force spokeswoman Rose Richeson said in an email. Those are the only CSO career fields that will be offered retention pay this year, she said. The Air Force is dropping retention pay for all other CSOs, such as those supporting bombers, C2ISR or command, control, intelligence, signals and reconnaissance, and mobility. Richeson said the retention rate for those career fields is "on course" and as a result, the bonuses are not needed. This program is open to lieutenant colonels and below who will not reach 16 years of total active federal military service by the end of the fiscal year that their undergraduate flying training active-duty service commitment expires. To be eligible, officers also must be qualified for operational flying duty and be entitled to and receiving monthly flight pay. Most officers will have to pay taxes on the bonuses, but some who are deployed to a combat zone could be exempted from paying taxes on them. This is the third year in a row the Air Force has allowed pilots to receive massive bonuses of up to $225,000. In the first two years, it was open only to fighter pilots. "The Air Force modifies the ARP program annually in order to meet current and future rated force requirements," Kelly said. "We continue to choose this viable, cost-effective method to retain experienced pilots and their expertise for command, staff and other rated requirements." Frankfurt, Germany -- The crash of Germanwings Flight 9525 in France has heaped intense pressure on Lufthansa's CEO Carsten Spohr, who in less than a year at the helm has had to grapple with weak earnings, labor unrest and tough competition from lower-cost carriers. 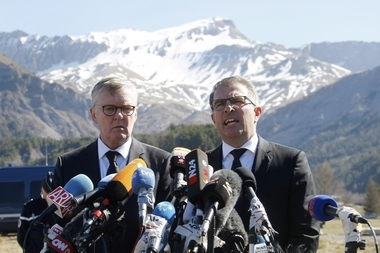 CEO of Germanwings Thomas Winkelmann, left, and Lufthansa CEO Carsten Spohr attend a news conference in early April near the site of the Germanwings jet crash in Le Vernet, France. Analysts say he has made the correct moves, notably in his swift expressions of sympathy for the 149 victims and the relatives of those who died last month. French officials say co-pilot Andreas Lubitz locked the pilot out of the cockpit and deliberately flew the Airbus A320 into a mountainside in the French Alps. 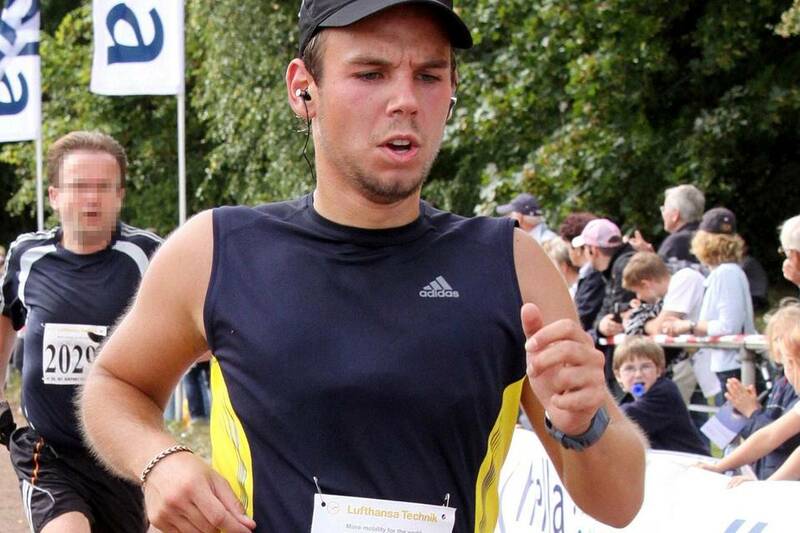 They point to Lufthansa's admission that Lubitz had told them during his training that he had been treated for serious depression as an example of owning up quickly to bad news. "They are taking it absolutely seriously, they are not being anything other than completely cooperative with the authorities, and that's a good start," said Andrew Charlton, managing director of strategic consulting and government affairs firm Aviation Advocacy in Nyon, Switzerland. Spohr, 48, is far from done with the grim ordeal. The investigation will take months. Still ahead is the April 17 memorial service in the massive cathedral in Cologne, near where Germanwings is headquartered. The crash has stained Lufthansa's strong safety reputation -- it is its worst crash since being revived after World War II in 1955 and the first fatal crash since 1993. "I have worked at Lufthansa as an engineer, I have worked as a pilot at Lufthansa, I have carried responsibility as a manager at Lufthansa for many, many years," he said. "Always, wherever I was, whoever my boss was, the rule was always safety is No. 1. And that this has happened to us -- I can only say we are sorry." Under an amendment to Philippine Civil Aviation Regulations, aircraft certified for two pilots must have a member of the flight crew, "preferably male", in the cockpit whenever one of the pilots has to leave the flight deck. Under current air regulations, cockpit doors must be locked once all of the airplane's external doors are closed and can only be opened inflight by authorized persons. Earlier this week, the Electronic Privacy Information Center (EPIC) filed a lawsuit against the FAA, arguing that the agency should not have avoided proposing privacy protections with its initial set of drone regulations. EPIC is asking the federal appeals court in Washington, DC to review the FAA's decision and declare it unlawful, since Congress originally required it to create a "comprehensive plan" that would "safely" incorporate unmanned aerial vehicles into American airspace. When the FAA unveiled its first draft of rules regarding drones, privacy guidelines were not included. The agency said such rules "are beyond the scope of this rulemaking." "In 2012, over 100 organizations, experts, and advocates joined EPIC in petitioning the FAA to establish privacy protections prior to the deployment of commercial drones in the United States," EPIC stated on its website. "In 2014, the FAA responded to EPIC's petition, claiming that drone privacy implications 'did not raise an immediate safety concern.'" In an overview of the suit, EPIC noted that drones can be "equipped with highly sophisticated surveillance technology that threatens personal privacy." It pointed to a drone's ability to gather personal data such as location and said their use "poses a public safety problem for millions of individuals." Civil liberties advocates were not the only ones upset with the rules, though. Companies like Amazon - which is testing deliveries-by-drone in Canada due to tight regulations in the US - said America is moving to slow to adopt new guidelines. The company said even the FAA's proposed rules are inadequate.